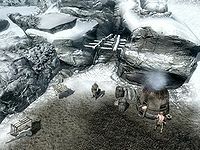 Quicksilver Mine is a quicksilver mine in the town of Dawnstar with five veins inside, and a smelter to the right of the entrance. It is owned by Leigelf. The mine is along the coast on the western part of town directly opposite the jetty where the Sea Squall is docked. While a notable mine, it is not marked on the map, but is easy enough to find relative to the dock. The entrance leads into a tunnel descending to the southwest. At the bottom it turns southeast and enters the main mining area with a maze of ledges above you on both sides. There are three quicksilver ore veins on the ground level, one on your right by a wooden ramp and two more at the rear on a wall beside each other. To the left of the ramp is a cart containing a piece of quicksilver ore and some pickaxes. More pickaxes are scattered throughout the mine. 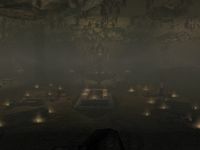 There is a campfire behind the central pillar on this level and to the left of the fire is an open crate containing two rolled up rugs and a copy of the Smithing skill book Cherim's Heart. Ascending the ramp by the first ore vein and then following the path to the southeast will lead you to the rear of the mine. You will find a wooden table with a mammoth steak, a sweet roll, a bottle of wine, a woodcutter's axe, a piece of cooked beef, a carrot and three pieces of clam meat here. To the left of the table, on the ground, is a fourth ore vein. Following the ledge to the left you will find a table with a woodcutter's axe, a leather helmet and a couple of pieces of bread on top. Staying against the wall and continuing around the mine you will fine the fifth and final ore vein with a ramp leading down in front. This ramp leads to some planking that forms a bridge across to the far side of the mine and a set of shelves holding a potion of magicka, a potion of stamina, a bottle of Nord mead, a woodcutter's axe, a loaf of bread, three bottles of wine and a piece of quicksilver ore.
Leigelf will buy quicksilver ore you possess. He can be found at the smelter during working hours. This page was last modified on 12 December 2018, at 00:05.